Take your taste buds on a tour of a winter wonderland with this creamy cheesecake. After preheating oven to 325°F, grease a 9-inch pan with cooking spray. In a large bowl, beat cream cheese and sugar using a stand mixer. Add eggs one by one, then add in sour cream, flour, peppermint extract, and salt; after it’s thoroughly mixed, fold in crushed candy canes gently. In a large bowl, combine graham cracker crumbs, sugar, salt, and melted butter. Press into pan and pour filling over evenly. Bake for one hour, or until the center of the cheesecake only moves a little bit when wiggled. Cool cheesecake in the oven for about 30 minutes after it’s done. Add whipped cream across the top, sprinkle with cinnamon and nutmeg if desired, and place peppermints along the edges for garnish before enjoying! 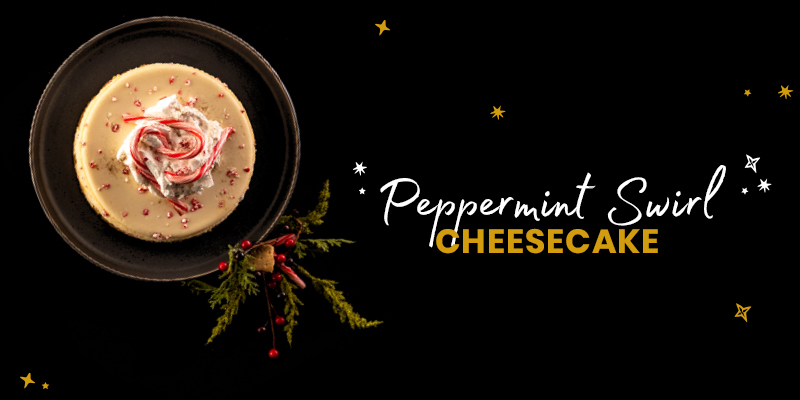 Order the ingredients for our Peppermint Swirl Cheesecake online or in store now!